This week we have a vintage postcard featuring Paul Bunyan and Babe the Blue Ox. The front of the card features scenes from Paula Bunyan's story. Paul is a popular fictional character in American folklore who exhibits super human strength. There are many (equally fictitious) claims of his birth location, Michigan apparently being one of them. The postcard also notes Gralying, Michigan on the front. 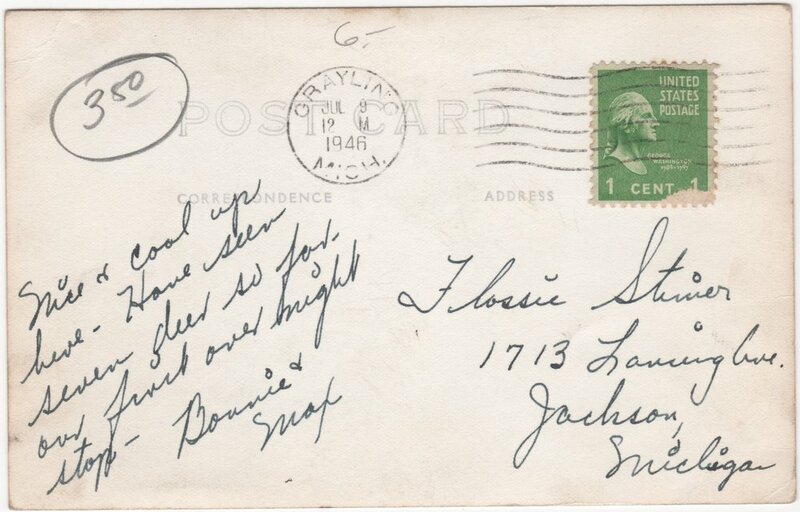 Postmarked from Grayling, MI in July of 1946, the card was addressed to a Flossie Stimer at 1713 Lansing Ave. in Jackson, MI. I can attest from decades of personal experience visiting Grayling (and decades in my family before I was born) that the two things you often write on postcards (or in guestbooks) is what the weather was like and how many deer you have seen. Apparently my family was not the only one that felt such observations were important to document. A quick search of Ancestry.com turns up at least one Flossie (aka, Florence) Stimer living in Jackson around this time. I have not been able to find mention of the 1713 Lansing address however. There was a Flossie Stimer listed in a 1942 Jackson, MI City Directory at a "Parma" street address. There also seems to be an older Flossie Stimer listed nearby. That's it for me this week. I am actually headed up to Grayling tomorrow for the 4th of July holiday, more than 70 years after this postcard was sent. Want a challenge? How about doing some of your own genealogy detective work. I would love to be able to send this card to a surviving family member who might appreciate it as a keepsake. Who were Bonnie and Max? What were they doing in Grayling? Is there anyone alive today who might appreciate having this postcard? What is Paul Bunyan's connection to Grayling? Older PostThe Halvangis Family at Evergreen Cemetery in Detroit, MI.